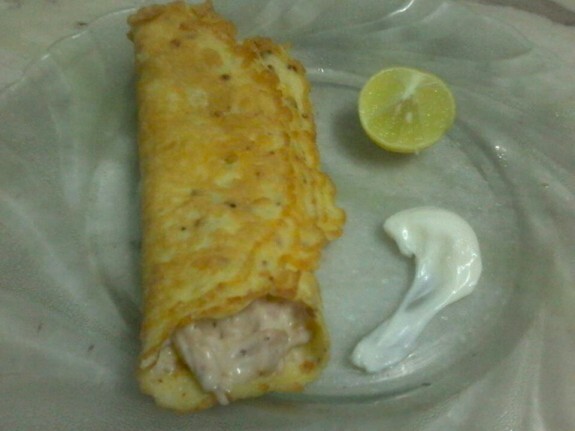 Simple Egg-roll stuffed with an exciting blend of different style chicken and mayonnaise will definitely change your mood. Get this easy to follow recipe and make it on your home. 1. Marinate the chicken breast with some salt, olive oil,red chili powder, black pepper powder and lemon for 30 mins. 2. Heat 3-4 drops oil in a grill pan and spread it over the pan. Keep the Chicken breasts on the Pan for grill. Flip it on the other side to grill. 3. Remove it from the pan and cut it into small pieces. 4. In a bowl, take 3-4 tbsp mayonnaise, 3-4 drops lemon and add the chicken breast pieces into it to make the stuffing. Mix it well. 5. Stuffed is ready. Keep it aside. 1. In another bowl, beat 2 eggs well and add some salt and green chilies. 2. Heat a pan and sprinkle some oil on the pan. Once oil heated, pour the beaten egg on the pan to make an egg roll. 3. Flip it on the other side of the roll to cook it properly. 4. Once it is finished, remove the roll from heat and put the stuffed into it. 5. 1Roll it properly with the stuffing and serve it hot.